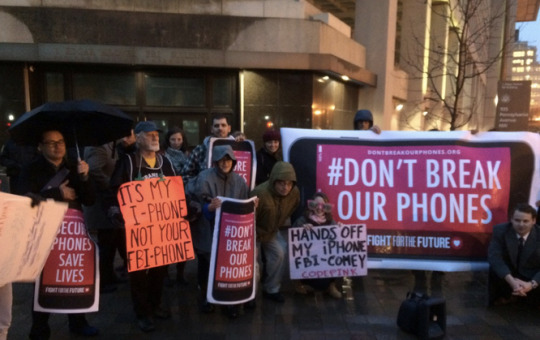 Concerned iPhone users and digital security supporters gathered at 5:30 pm local time at FBI headquarters in DC and at Apple stores in nearly 50 cities today, Tuesday, February 23rd. Today marks one week after the Justice Department won a court order that attempts to force Apple to write software that would undermine the safety and security of hundreds of millions of people. Protesters opposed the DOJ’s demand, carrying giant 10-foot long iPhone banners, and iPhone shaped signs reading “FBI: Don’t Break Our Phones” and “Secure Phones Save Lives.” Participants also turned their phones, laptops, and tablets into glowing protest signs using ProtestSign.org. The rallies were called for by Fight for the Future and are supported by Demand Progress, CREDO, and other advocacy organizations. Residents across the country immediately began to offer to host an event in their town and submitted the event to Fight for the Future, who provided banners and support with recruitment. Rallies were planned across the U.S. in small cities like Anchorage, Alaska, and major ones including New York, San Francisco, Washington, DC, Chicago, Los Angeles, Palo Alto, Minneapolis, Philadelphia and Boston. Outside the U.S., residents in London and Munich hosted rallies to express their concern about companies being forced to weaken encryption as a result of government pressure. This past Wednesday, San Francisco organizers hosted a rally with dozens of San Francisco residents that day on just a few hours notice. For interviews with Fight for the Future and Demand Progress staff members, please email press@fightforthefuture.org. 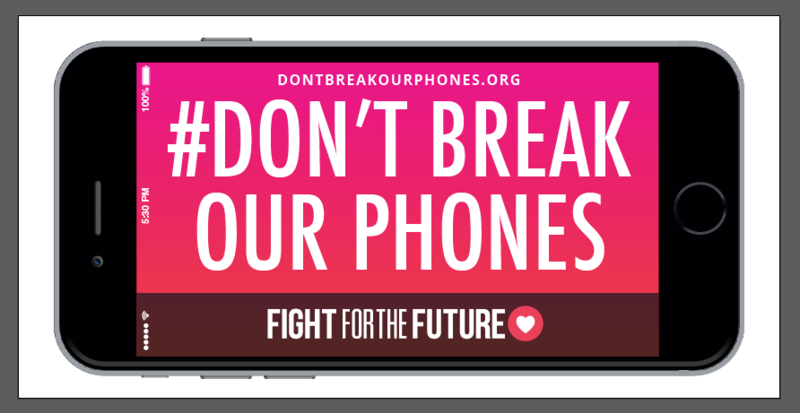 Fight for the Future works to defend the Internet as a free and open platform for expression and creativity, and is best known for their role organizing the massive online protests against SOPA, the Internet Slowdown for net neutrality, and the Reset The Net campaign for online security and privacy.